The information that current Bulgarian Prime Minister Boyko Borisov and powerful and controversial lawmaker and media mogul Delyan Peevski are a tandem and act together has emerged from another conversation between former judges Vladimira Yaneva, Rumyana Chenalova and attorney Momchil Mondeshki. The two share the money and the power and have divided the State among themselves. From a previous conversation, we learned that the services are not controlled by Boyko, but by Delyan. Boyko, however, wanted CCB for himself and there was no way for Delyan to pressure him. Yaneva is making these revelations to Mondeshki at the moment when Chenalova is out of her home to buy cigarettes. They speak quietly and in order to understand their words, the sound file had to be treated against background noise. Mondeshki again offers to talk to Boyko, or to Tsvetan (Tsvetan Tsvetanov – former Interior Minister and leading figure in the ruling Citizens for European Development of Bulgaria party, GERB – editor’s note) in an attempt to save Yaneva from the “finishing”. She refuses, saying she is the one that has to talk to him. Mondeshki encourages her not to delay such conversation because otherwise “the embarrassment would be huge”. According to his words, Boyko wanted to get rid of Yaneva because of the CCB bankruptcy case, which eluded him and Delyan would not be able to fix things this time. “Nonsense … They always played party. It makes no sense. He has no other way,” says Yaneva. According to her, “Delyan” cannot exert pressure and lie to “Boyko” about CCB, because he is not in power, and the trustees must be approved by Boyko, through the Finance Minister. Mondeshki, however, is not convinced. “They will launch a second and third case and things will turn messy,” he warns Yaneva. One cannot find out from the conversation who these people who will organize the “mess” are, but apparently this is related to the control of CCB. The conversation was held on February 19, 2015, on the day when the Supreme Judicial Council (SJC) voted to suspend Yaneva from the post of President of the Sofia City Court (SCC). The temporary trustees of CCB, Lazar Iliev and Rosen Angelchev (agent of the former Communist State Security), were appointed on March 25, 2015, after, on a proposal by Boyko Borisov, the Parliament amended on March 18 the law on bank insolvency. The decision of the SCC with Judge Ivo Datchev presiding over the CCB case was delivered on April 22, 2015, while the temporary trustees were appointed as permanent ones on April 24, 2015. The words of Vladimira Yaneva that Boyko and Delyan always “played party” can be constituted as reliable information from an informed witness. Besides being very well informed as President of the most important court in the country, Yaneva has repeatedly stated in conversations that she knew Boyko Borisov very well and even played cards in his home in Bankya. In addition, she apparently has a good relationship with Delyan who “spoke with Boyko and Sotir” (the Prime Minister and the Prosecutor General) in an attempt to save her from “being finished”. The information that Boyko and Delyan “play party” was also mentioned in an interview of banker and former CCB majority shareholder Tsvetan Vassilev. According to Vassilev, the man who provided for years funding for the numerous secret business projects of Peevski and his family, Borisov and Peevski have a shared hidden ownership in tobacco manufacturer Bulgartabac. So far the prosecution refuses to examine the revelations of the banker in exile. There is also no will to probe the Yaneva Gate recordings which contain evidence of a crime against justice committed by the very same Prosecutor General, Sotir Tsatsarov. According to the prosecution a key piece of information revealed in this conversation relates to establishing the identity of the dog that can be heart in the recordings. This is Benny, Chenalova’s dog that obviously loves to chew the shoes of her guests. After Chenalova slams the door, Benny rushes after her and Mondeshki threatens it with a kick. Over the years, Peevski and Borisov have not always demonstrated closeness. Their relationship rather follows the logic of controlled sharing of business power between “two clans”, as Tsvetan Vassilev says. To “play party” does not mean that there is solidarity and understanding between the clans. They “are pressuring” each other and “are lying” to each other in order to swallow as many public resources as possible. The one that currently holds the power dominates. 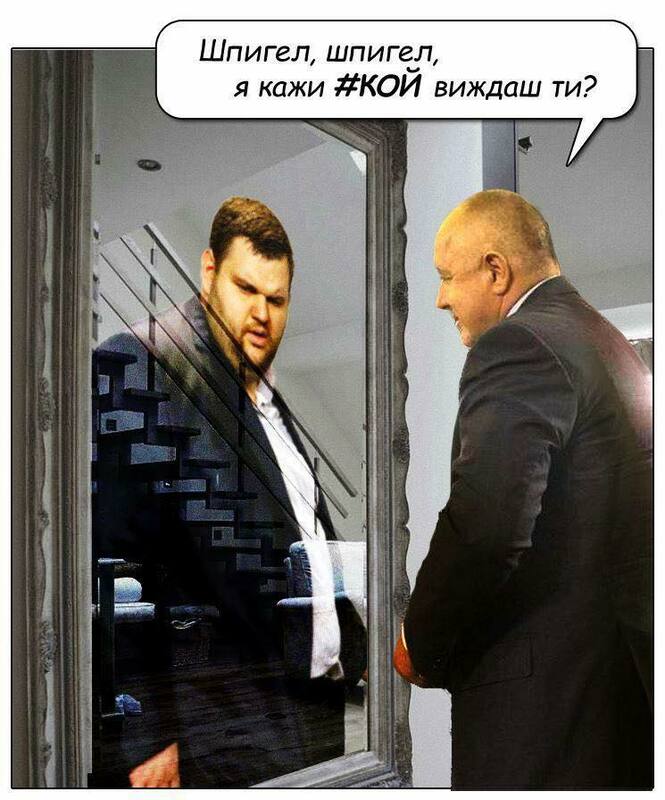 Over the years, Peevski has betted on other “players” as well and this can be tracked best through the attitude of his media towards Borisov – from “crucify him” to “hosanna”.